Since 1989 neo-nationalism has grown as a volatile political force in almost all European societies in tandem with the formation of a neoliberal European Union and wider capitalist globalizations. 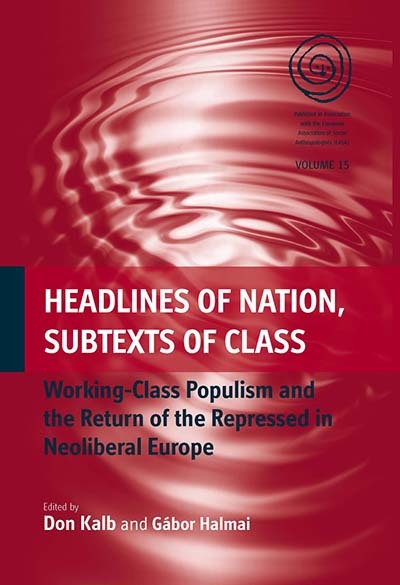 Focusing on working classes situated in long-run localized processes of social change, including processes of dispossession and disenfranchisement, this volume investigates how the experiences, histories, and relationships of social class are a necessary ingredient for explaining the re-emergence and dynamics of populist nationalism in both Eastern and Western Europe. Featuring in-depth urban and regional case studies from Romania, Hungary, Serbia, Italy and Scotland this volume reclaims class for anthropological research and lays out a new interdisciplinary agenda for studying identity politics in the intensifying neoliberal conjuncture. Don Kalb is Professor of Sociology and Social Anthropology at Central European University, Budapest, and Senior Researcher at Utrecht University, the Netherlands. His books include Expanding Class: Power and Everyday Politics in Industrial Communities, The Netherlands, 1850-1950 (Duke University Press 1997); The Ends of Globalization. Bringing Society back in, (ed., Rowman and Littlefield 2000); Globalization and Development: Key Issues and Debates (ed., Kluwer Academic 2004); Critical Junctions: Anthropology and History beyond the Cultural Turn (ed., Berghahn Books 2005). He is the founding editor of Focaal – Journal of Global and Historical Anthropology. Gábor Halmai is a PhD candidate at the Department of Sociology and Social Anthropology, Central European University in Budapest, finalizing a doctoral project that is a comparative investigation into two collective struggles against semi-peripheral “transitions,” namely the nationalist movement in Hungary and the socialist MST in Brazil.